Some survivors of narcissistic abuse adopt the role and posture of a martyr, a “professional” victim. In doing so, they become self-centred, devoid of empathy, abusive, and exploitative. In other words, they become narcissists. “In 2011 psychologists Agata Blachnio and Malgorzata Weremko of Catholic University of Lublin in Poland described an experiment in which students took a spelling test in a room secretly fitted with a one-way mirror. A dictionary and a thesaurus were in the room, but the students were asked not to use them. Subjects were three times as likely to cheat when an assistant posing as a cheating student was also present. In fact, unchecked dishonesty can promote the perception that one must cheat to remain competitive. Such observations have led Ariely to refer to cheating as 'infectious.' ... This kind of social contagion may help explain the high prevalence of cheating in relatively small groups of people. For example, 125 Harvard students were recently under investigation for cheating on the final examination in an introductory government course. (More than half these students were told to withdraw from school for up to a year as punishment.) It is statistically unlikely that nearly half the 279 students in that class are sociopaths given the low prevalence of sociopathy -- about 3 percent in males and 1 percent in females. A more plausible explanation is contagion. The widespread bending of the rules probably led students to conclude that collaborating with other students was okay." Is narcissism "contagious"? Can one "catch" narcissism by living with a narcissist, like catching fleas from a dog? The psychiatric profession uses the word: "epidemiology" when it describes the prevalence of psychopathologies. There is some merit in examining the incidence of personality disorders in the general population. Mental health is the visible outcome of an intricate interplay between nature and nurture, genetics and culture, the brain and one's upbringing and socialization as well learned behaviors and reactions to peer-pressure and peer-emulation. Yet are personality disorders communicable diseases? The answer is more complex than a simple "yes" or "no". Personality disorders are not contagious in the restricted, rigorous, medical sense. They are not communicated by pathogens from one individual to another. They lack many of the basic features of physical-biological epidemics. Still, they are communicated. First, there is the direct, interpersonal, influence. A casual encounter with a narcissist is likely to leave a bad aftertaste, bewilderment, hurt, or anger. But these transient reactions have no lasting effect and they fade with time. Not so with more prolonged interactions: marriage, partnership, cohabitation, working or studying together and the like. Narcissism brushes off. Our reactions to the narcissist, the initial ridicule, the occasional rage, or the frustration – tend to accumulate and form the sediment of deformity. Gradually, the narcissist distorts the personalities of those he is in constant touch with, casts them in his defective mould, limits them, redirects them, and inhibits them. When sufficiently cloned, the narcissist uses the people he affected as narcissistic proxies, narcissistic vehicles of vicarious narcissism. The narcissist provokes in us emotions, which are predominantly negative and unpleasant. The initial reaction, as we said, is likely to be ridicule. The narcissist, pompous, incredibly self-centred, falsely grandiose, spoiled and odd (even his manner of speech is likely to be constrained and archaic), often elicits smirks in lieu of admiration. But the entertainment value is fast over. The narcissist's behaviour becomes tiresome, irksome and cumbersome. Ridicule is supplanted by ire and, then, by overt anger. The narcissist's inadequacies are so glaring and his denial and other defence mechanisms so primitive that we constantly feel like screaming at him, reproaching him, or even striking at him literally as well as figuratively. Ashamed at these reactions, we begin to also feel guilty. We find ourselves attached to a mental pendulum, swinging between repulsion and guilt, rage and pity, lack of empathy and remorse. 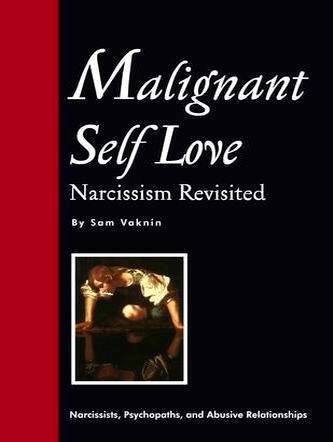 Slowly we acquire the very characteristics of the narcissist that we so deplore. We become as tactless as he is, as devoid of empathy and of consideration, as ignorant of the emotional makeup of other people, and as one track minded. Exposed in the sick halo of the narcissist, we have been "infected". The narcissist invades our personality. He makes us react the way he would have liked to, had he dared, or had he known how (a mechanism known as "projective identification"). We are exhausted by his eccentricity, by his extravagance, by his grandiosity, by his constant entitlement. The narcissist incessantly, adamantly, even aggressively makes demands upon his human environment. He is addicted to his Narcissistic Supply: admiration, adoration, approval, attention. He forces others to lie to him and over-rate his achievements, his talents, and his merits. Living in a narcissistic fantasyland, he compels his closest, nearest and dearest to join him there. The resulting exhaustion, desperation and weakening of the will are fully taken advantage of by the narcissist. He penetrates these reduced defences and, like a Trojan horse, spews forth his lethal charge. Gradually, those in proximity to him, find themselves imitating and emulating his personality traits. The narcissist also does not refrain from intimidating them into compliance with his commands. The narcissist coerces people around him by making subtle uses of processes such as reinforcement and conditioning. Seeking to avoid the unpleasant consequences of not succumbing to his wishes, people would rather put up with his demands and be subjected to his whims. Not to confront his terrifying rages, they "cut corners", pretend, participate in his charade, lie, and become subsumed in his grandiose fantasies. Rather than be aggressively nagged, they reduce themselves and minimise their personalities. By doing all this – they delude themselves that they have escaped the worst consequences. But the worst is yet to come. The narcissist is confined, constrained, restrained and inhibited by the unique structures of his personality and of his disorder. There are many behaviours which he cannot engage in, many reactions and actions "prohibited", many desires stifled, many fears insurmountable. The narcissist uses others as an outlet to all these repressed emotions and behaviour patterns. Having invaded their personalities, having altered them by methods of attrition and erosion, having made them compatible with his own disorder, having secured the submission of his victims – he moves on to occupy their shells. Then he makes them do what he has always dreamt of doing, what he has often desired, what he has constantly feared to do. Using the same compelling procedures, he drives his mates, spouse, partners, colleagues, children, or co-workers into collaborating in the expression of the repressed side of his personality. At the same time, he negates their vague suspicion that their personality has been replaced by his when committing these acts. The narcissist can, thus, derive, vicariously, through the lives of others, the Narcissistic Supply that he so craves. He induces in his army of zombies criminal, romantic, or heroic, impulses. He makes them travel far and fast, breach all norms, gamble against all odds, fear none – in short: he transforms them into that which he could never be. The narcissist thrives on the attention, admiration, fascination, or horrified reactions lavished upon his proxies. He consumes the Narcissistic Supply flowing through these human conduits of his own making. Such a narcissist is likely to use sentences like "I made him", "He was nothing before he met me", "He is my creation", "She learned everything she knows from me and at my expense", and so on. Sufficiently detached – both emotionally and legally – the narcissist flees the scene when the going gets tough. Often, these behaviours, acts and emotions induced by the proximity to the narcissist result in harsh consequences. An emotional or legal crisis, a physical or material catastrophe - are common outcomes of doing the narcissist's bidding. The narcissist's prey is not equipped to deal with the crises that are the narcissist's daily bread and which, now, he or she are forced to confront as the narcissist's proxy. The behaviour and emotions induced by the narcissist are alien and the victim experiences a cognitive dissonance. This only aggravates the situation. But the narcissist is rarely there to watch his clones writhe and suffer. At the first sign of trouble, he goes missing. This vanishing act is not necessarily physical or geographical. The narcissist is actually better at disappearing emotionally and at evading his moral and legal obligations (despite his constant self-righteous moralising). It is then and there that his family and coterie discover his true colours: he uses and discards people off-handedly. To him, people are either "functional" and "useful" in his pursuit of Narcissistic Supply – or not. But, in both cases, to him, they are not human but objects, or mere cartoons. Of all the hurts that the narcissist inflicts this abrupt and contemptuous disregard, probably, is the strongest and most enduring one. The interaction between the narcissist (or psychopath) and his victim is not clear-cut. Many victims deploy narcissistic defenses, are narcissistically injured, and rage, exactly as narcissists do. They are drawn to their abusers, in the first place, precisely because they like to be the center of attention and to be assured of their self-imputed uniqueness. The narcissist is good at making his prey feel this way. Then, when the victims are devalued and discarded, they endure a scarring narcissistic injury and react with unmitigated wrath. Some people – many narcissists included! - adopt the role of a professional victim. In doing so, they become even more self-centred, devoid of empathy, abusive, and exploitative. In other words, they become narcissists. The role of "professional victims" - people whose existence and very identity rests solely and entirely on their victimhood - is well researched in victimology. It doesn't make for a nice reading. These victim "pros" are often more cruel, vengeful, vitriolic, lacking in compassion and violent than their abusers. They make a career of it. They identify with this role to the exclusion of all else. It is a danger to be avoided. And this is precisely what I call "Narcissistic Contagion" or "Narcissism by Proxy". The affected entertain the (false) notion that they can compartmentalize their narcissistic behavior and direct it only at the narcissist. In other words, they trust in their ability to segregate their conduct and to be verbally abusive towards the narcissist while civil and compassionate with others, to act with malice where the narcissist is concerned and with Christian charity towards all others. They cling to the "faucet theory". They believe that they can turn on and off their negative feelings, their abusive outbursts, their vindictiveness and vengefulness, their blind rage, their non-discriminating judgment. This, of course, is untrue. These behaviors spill over into daily transactions with innocent neighbors, colleagues, family members, co-workers, or customers. One cannot be partly or temporarily vindictive and judgmental any more than one can be partly or temporarily pregnant. To their horror, these victims discover that they have been transmuted and transformed into their worst nightmare: into a narcissist. They find out the hard way that narcissism is contagious and many victims tend to become narcissists themselves: malevolent, vicious, lacking empathy, egotistical, exploitative, violent and abusive. There is no typical victim of narcissistic abuse ("n-magnet"). Having found themselves in an abusive relationship, victims tend to react predictably (for example: by behaving as codependents do.) It takes all kinds to fall for a narcissist and people fall for narcissists at different points in their lives (for instance, after a life crisis, or on a rebound). The narcissist then moulds all his victims, regardless of their provenance, psychodynamics, or traits, into a more or less uniform mass. The narcissist is the Great Homogenizer, a Leveller of Humanity, a Human Blender. Victims on the Internet, in support forums and social media, are a non-representative sample: they are assertive, self-aware, infuriated, vindictive, hurt, often dysfunctional, and, at times, bask in their newfound role as a victim or scapegoat. Their victimhood acquires the status of an organizing principle or an exegetic narrative. They are on the Internet for all to read, actively soliciting and seeking an audience to interact with. True, they have opted to go online ostensibly merely to seek help and succor, but, invariably, there is an exhibitionistic streak involved: ostentatious - and therefore somewhat narcissistic - victimhood. Only a tiny fraction of the total number of victims choose this venue and those who do are, by definition, a self-selecting and flawed sample.